The Earth is about to explode and Dr. Brainz needs your help. Take a seat in your advanced off-road transforming truck and tackle some of the most difficult terrains to gather the necessary artifacts needed to build the Magma Stabilizing Machine. – Off-road Truck – this is your default driving choice, a versatile, fast and durable truck that is best suitable for rough terrain, ramps and jumps. – Gun Truck – sometimes it’s better to blast through obstacles than pass over them. Use your gun to clear a path through exploding barrels and debris. – Drill Truck – sometimes even the mighty Gun Truck can’t blast through tonnes of stones and concrete walls and this is where the drill transformation comes in handy. – Helicopter – this special transformation will allow you to fly over difficult terrain. Your different trucks are great but you can make them even better. 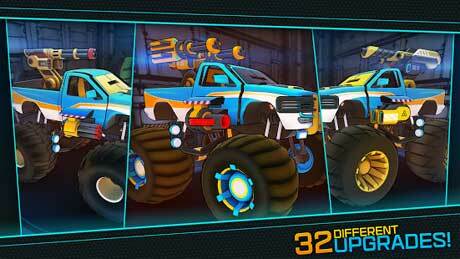 Each of the 4 trucks gets a series of upgrades that will improve their characteristics. 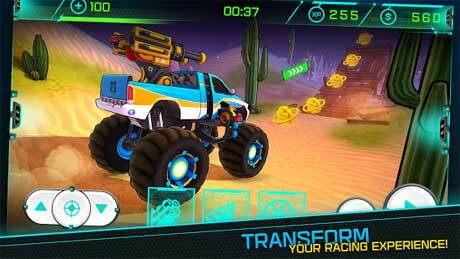 The upgraded wheels will increase the acceleration and top speed of your truck and more powerful guns will allow you to destroy obstacles faster. Upgrading all trucks will help you finish the levels in time. Unlike other truck racing games, Trucksform tests your reaction speed and decision making – learning how and when to transform will help you complete levels that otherwise seem impossible to finish. 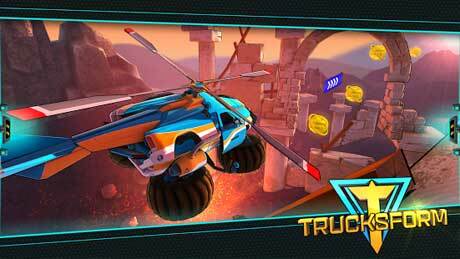 Drive, transform, shoot, fly and drill your way through all the 60 levels of the game – time to Trucksform!